It's a sweet emotion when your first tour van turns up in the forest. Lots of interesting things can be found in the woods, including legendary rockers Aerosmith‘s original tour van. The hosts of History Channel’s American Pickers recently discovered the van in the Western Massachusetts woodlands. Aerosmith’s custom-pained 1964 International Harvester Metro went missing in the ’70s, as noted by Fast Company. But the show’s Mike Wolfe and Frank Fritz found someone identified as Phil who claimed to have uncovered the van in the brush. Phil told the American Pickers duo that the van was on the property when he first purchased the land. (A previous owner was affiliated with the band.) However, the hosts were initially unable to verify its Aerosmith authenticity. That’s right, Aerosmith bought back their original tour van after it was found in the woods almost a half-century later. We’d be crying if it weren’t so amazing that the group won’t miss another thing with their old tour van, dude. Watch the Pickers spot the original Aersomith van below. 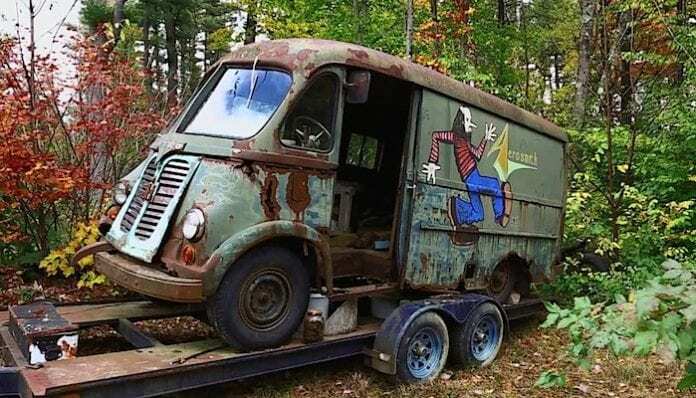 What do you think of the amazing discovery of Aerosmth’s original tour van? Are you an avid watcher of History’s American Pickers? What’s your favorite Aerosmith song? Sound off in the comments section and let us know your take.